Also referred to as INTP, ISTP, IxTP, ITP, or Introverted Thinker personality. 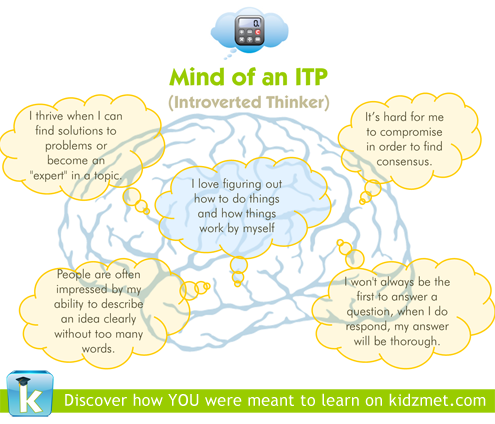 The ITP child is a process-oriented problem solver that is quick to learn new things and most likely relishes both independence and unstructured environments where this child can focus on discovering unconventional ways to analyze and solve complex problems. Often shy except with their best friends, people like this child often don’t enjoy being told what to do…but probably don’t want to tell others what to do, either. this child’s special challenge is probably making their ideas understood, as s/he tends to overcomplicate issues. Your introverted thinker relishes problem solving and likes to find flaws in ideas or plans. A natural debater, your child will try to justify answers or defend positions both with others. As such, both parents and teachers should be specific with both critiques and praise of an introverted thinker’s assignments and/or attitudes. This child most likely produces the best work under the pressure of a single precise deadline versus a time line with multiple due dates, so having a calendar with upcoming long-term project due dates highlighted will allow your introverted thinker to keep percolating on general ideas and themes for each assignment, then sprint to the finish with final drafts. Your child’s perceiving nature finds strength in “pulling all-nighters” on assignments, which can be a real challenge for parents with judging personality types. Use words like “try”, “experiment” or “attempt” with Introverted Thinkers. Try to avoid words like “practice”, “should” and “work”. If you’d like to plan a study group for your child, be sure to keep it small and, preferably with other introverts, as Introverted Thinkers prefer to think through responses before offering a perspective, and will hesitate to interrupt the flow of conversation—even if they’ve formulated a response. Your child recharges his or her batteries with alone time, so be sure to allow time for solitary “recentering” each day before starting homework. Encourage your young ITP child to accept both success and defeat with grace. Help your introverted thinking child give praise when it’s due and (2) bring up what s/he agrees during a discussion before pointing out the areas where they disagree. One of the most important skills you can teach this type of child is how to better estimate how long an assignment will take—e.g., planning work from the due date backward.